Meet Laura, the amazing designer and Etsy shop owner of luna and bean! She is one talented lady, creating premium burp clothes for chic moms, and I'm so happy to have her as a blog sponsor on JFTB! Please take a minute to read about Laura and enter her fabulous giveaway below! My name is Laura and I am the designer behind luna and bean. I started sewing baby items a few years ago when a lot of my friends and family members were pregnant. I moonlight as a baby items designer at night and a graduate student by day (among other jobs and internships). Because my studies aren't exactly in the creative realm, I needed a way to express that side of my self. I started sewing baby items a few years ago when a lot of my friends and family members were pregnant. All of my preggo friends gave me the perfect opportunity to express my creative side and before I knew it, luna and bean was born. I started my Etsy shop in January of this year hoping at best to make a few sales a month. I have been so blessed with the response to luna and bean products - it's wonderful to think that babies around the US are enjoying them! I strive to make top quality, handmade, beautiful items that are both practical and stylish for mom and baby. Just because feeding can be messy task, who says it can't be beautiful as well? I don't necessarily have a favorite product from my shop. All of the fabrics that I use I love! I don't think that there is one fabric in my shop that I wouldn't purchase for my own future baby's nursery. I actually had the opportunity to review some luna and bean items and honestly? They're so nice I don't even want to use them! I kid. Sort of. I definitely plan to use them for drool and not food/bottles/spit up just because they're so nice, ha! But they feel so soft and are such great quality items. See. I told you they were almost too nice to use. And Reid? Well he loves them too. This is his "would you please stop taking pictures and just feed me" face. It works every time. LOVE. I almost can't stand the cute. Now it's your turn! 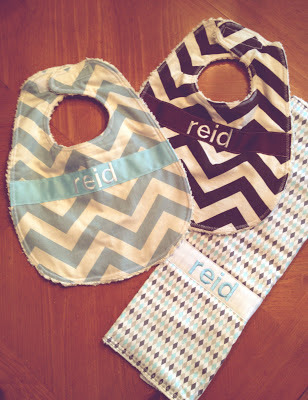 luna and bean is graciously giving away a personalized matching bib and burp cloth set! Follow the options on Rafflecopter to enter the giveaway below... you have up to 12 chances to win! Thanks for sharing this great etsy store! I would love this for my October babe. I love the Aqua and Gray Zoology, but they're all so cute! Love, love, love the owl set--so cute! Love the girl Chevron big, actually I love them all but you made me pick one :) So, so cute!! 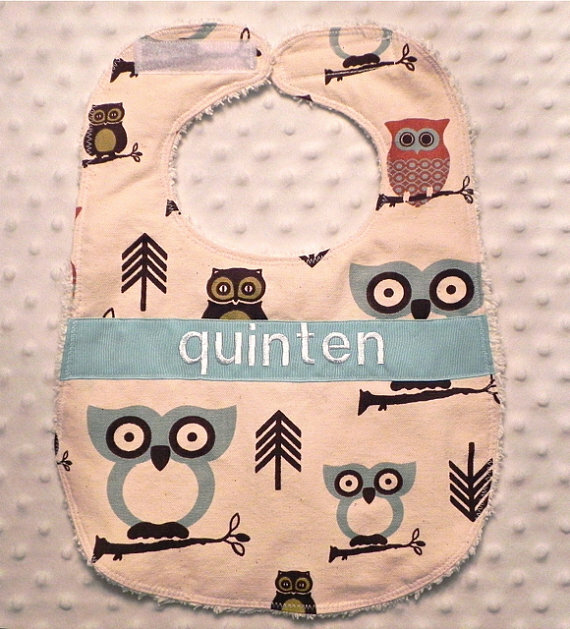 Love the owl bib, the elephant and the chevron!! So sweet!! These are so so sweet! I love the yellow and grey chevron! Love this :) I would possibly ask if she had or could get the bermuda birds fabric I've been finding and using lately. I love Baby Boy Aqua and Gray Flannel Zoology burp cloths and the chevron bibs. I love those bibs! Anything personalized always gets me, but these are really unique and beautiful! Love this place! I would so want the retro cowboy bib and either the retro cowboy and horseshoes or baby boy lime green and blue. I'm due with my first in June 2013--would love the chevron bibs and burp cloths. So glad someone, somewhere is making classy baby accessories! 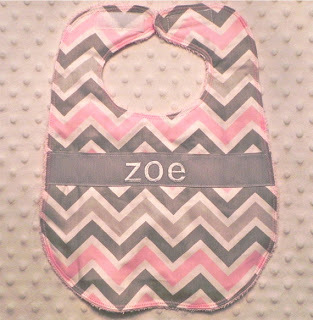 My sister is due with a baby girl at the end of December...how cute would the name Penelope, or her nickname Poppy, look on the pink & gray chevron bib!? Yes please. Gorgeous! 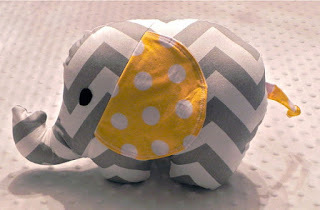 I love the chevron--they match my little girl's nursery! aqua, yellow, & gray gender neutral set! Chevron is my favorite! My sweet Beckett would look handsome in these! These are so cute! I love the ones with the Strawberries on it! So sweet! I want either the chevron (any color) or the navy blue anchors (my husband is in the navy!) for the baby boy I'm expecting in March! I love the set with the black and white mustaches, chevron, and polka dots! 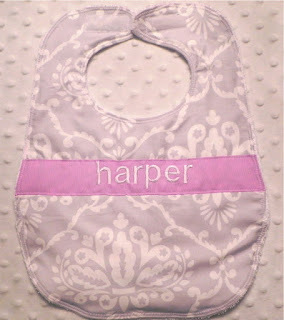 Such a cute little bib and burp cloth combo. Love it! Boys aqua gray and red chevron polka dots please. 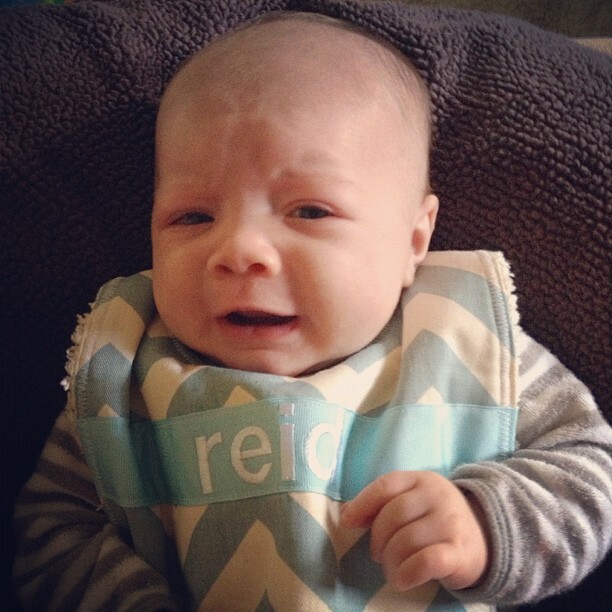 These bibs are too cute! I love the chevron ones. They'd be perfect for my baby boy due in January. I love the Gray Mod Medallions, Light Pink and Green Suzani Medallions and the Tan and Pink Leopard and Chevron. I love the pink & grey zoology! Also if I'm on a hiatus from Facebook till after the holidays is it still possible to win?! Thanks for the giveaway! 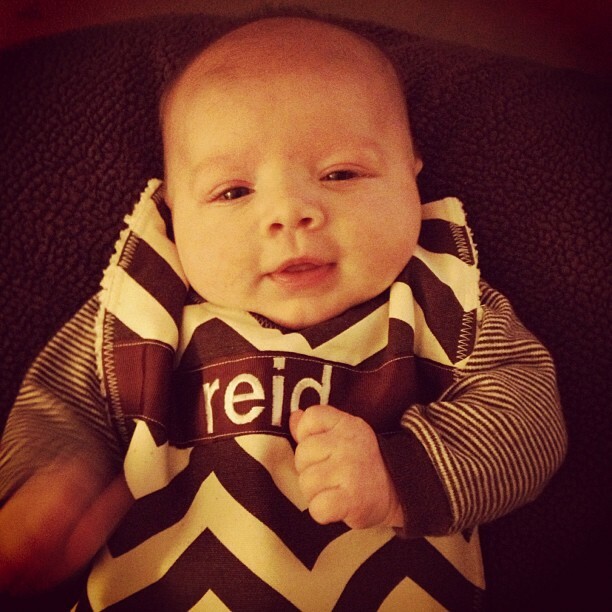 I love pretty much all of the boy Chevron print bibs! This would be a beautiful gift for my friend who is having their first baby in January. Very cute, I wanna win!! I love the Personalized Burp Cloths - Orange and Gray Chevrons and Polka Dots. These are just adorable! I love the bib with the owls! These are all so cute, I have to wait and see if our babe is a boy or girl before deciding which one to get! those are so cute! i love chevron!! 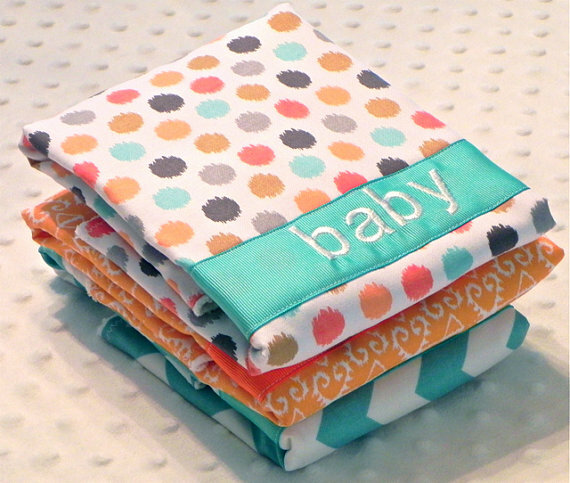 A mom can never have too many burp cloths! chevron! baby #1 due in feb! thanks! They are all so cute. Lately though, I cant' get enough of chevron! Oh so cute!! So many different options! 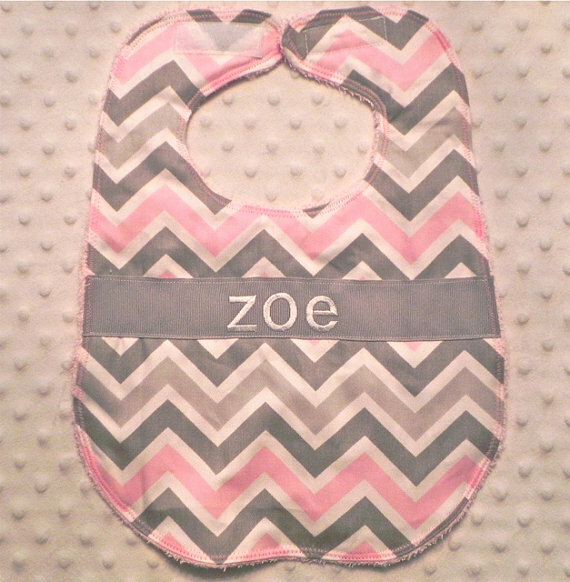 Probably one of the chevron bibs in pink!